Over the past decade, optical technologies have become an indispensable part of daily life: fiber optics for telecoms, optical methods for medical imaging and cancer research, and optical parts in cars and computer screens are at the core of the world’s technical infrastructure. 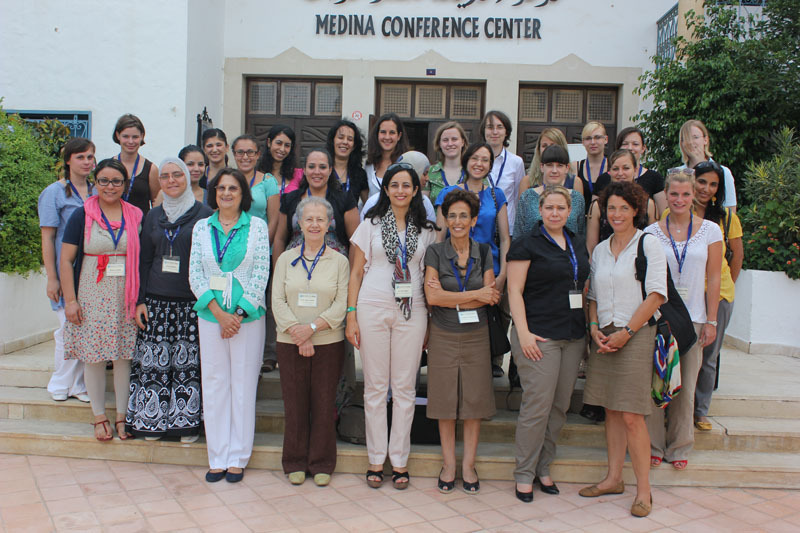 The need for more experts in this discipline — along with the desire to encourage more women to pursue careers in science and engineering in a region disrupted by violent protests from the Arab Spring — inspired two universities to organize a summer school program for young female scientists: Get Ahead with Optics. In September, the University of Carthage School of Communication Engineering in Tunisia and Philipps-University Marburg in Germany hosted their 10-day program in Yasmine Hammamet. The aim was to orientate young women scientists in the rapidly evolving fields of optics and photonics while giving them career skills and a deeper understanding of what is needed to succeed as a woman scientist, said Kirstin Baum the initiator of the program and a doctoral candidate in medical engineering at Philipps-University. A $45,000 grant from the Elsevier Foundation New Scholars program enabled the summer school to host 23 scientists in an immersive program that “created a stimulating atmosphere for interaction and learning,” explained co-convenor Rim Cherif. The event combined formal lectures with sessions on career/life management, discussion panels, roundtables and social events. The program was supported by additional funding of from the Optical Society of America (OSA), the International Society for Optics and Photonics (SPIE) and the German Academic Exchange Service (DAAD). The academic program targeted master’s students. Fourteen international lecturers and guest speakers presented on the various applications for optics and gave sessions on public speaking, scientific writing, presentation training, CV and cover letter writing and good scientific practice. Other workshops included a session on the differences between Tunisian and German cultures and a computer lab tutorial on simulating physical problems that can be described with partial differential equations. Students were required to present a scientific poster on optics and photonics before a review committee. It's only a month ago that we had this great summer school and I already feel how much I profited from it, especially about the soft skill courses (public speaking, presentation training, scientific writing.. ) The presentation training was so good to learn how to structure presentation, texts and ideas! But what is hard is not to see all these nice people. I'm curious to follow what the others will choose after their studies and in which areas they will be afterwards. Maybe in some years one can meet again, in Tunisia or Germany..? I guess with an education in optics, people will spread in many areas: University, medical optics, lasers, microscopes, imaging.. And who knows in how many countries people will live then? I already know of some who finished their studies in the last months and started new projects. Right now is a busy time for many of us. Let's see what the future will bring – I hope for the following generations of students that there will be many more summer schools like this! It's only a month ago that we had this great summer school and I already feel how much I profited from it, especially about the soft skill courses (public speaking, presentation training, scientific writing) … But what is hard is not to see all these nice people. I'm curious to follow what the others will choose after their studies and in which areas they will be afterwards. Maybe in some years one can meet again, in Tunisia or Germany? I guess with an education in optics, people will spread in many areas: University, medical optics, lasers, microscopes, imaging… And who knows in how many countries people will live then? … Let's see what the future will bring – I hope for the following generations of students that there will be many more summer schools like this! 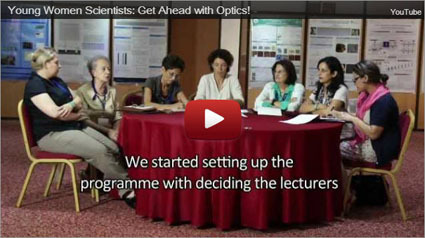 The keynote speakers were established women scientists in the fields of optics and photonics. Dr. Zohra Ben Lakdar is Professor Emeritus of Physics at the University of Tunis-El Manar. She received the 2005 L'Oreal-UNESCO Award Laureate for Africa for her experiments and models on infrared spectroscopy and its applications to pollution detection and medicine. She is founder of the Tunisian Optical Society, serving as president from 2002 to 2012, and Vice President of the International Commission for Optics (ICO). Dr. Maria Yzuel is a professor at the Department of Physics, Universidad Autónoma de Barcelona, and has served on the faculty since 1983. 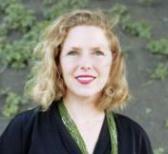 She is a member of the Royal Academy of Sciences and Arts of Barcelona and. She received the Internaional Society for Optics and Photonics (SPIE) Board of Directors Award in 2005 and was SPIE president in 2009.